Since 1965, we've provided Pompano Beach with concrete vent blocks manufactured to match any style of home or commercial business. Offering both decorative and functional louvers, our vent blocks, also called breeze-blocks or pattern blocks, are made from precast concrete. This sustainable, easy to maintain and every reliable building material is popular for a wide range of applications, and will stay strong for years. In warm climates like Pompano Beach, concrete vent blocks can add beauty to your architectural look while providing shade from the sun's heat. Air and natural light can filter through your vent blocks, maintaining circulation and allowing trapped moisture to exit. They will also block wind, rain, and other debris from entering your space without closing it off completely. 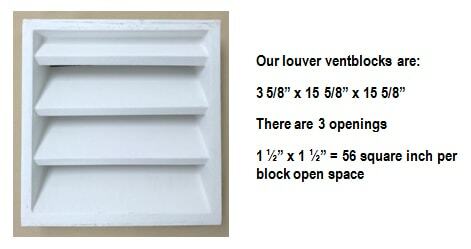 In warehouses, stairwells, feature walls, garages, crawlspaces, and more our vent blocks can serve a real purpose. Damp rot, mildew, mold, and termites will flourish without cool, fresh air circulating beneath your home or business. We can offer two-piece Pompano Beach concrete vent blocks or decorative blocks that arrive in a single piece and do not allow air to pass through. Atlantic Coast Precast is fully qualified to work with any contractors, architects, engineers, designers, or other industry professionals to bring their ideas to life. Get your FREE quote, today.